The War of Tablets – Who will win? The statement by Jeff Bezos of Amazon tells us that the war of tablets is not just about hardware. 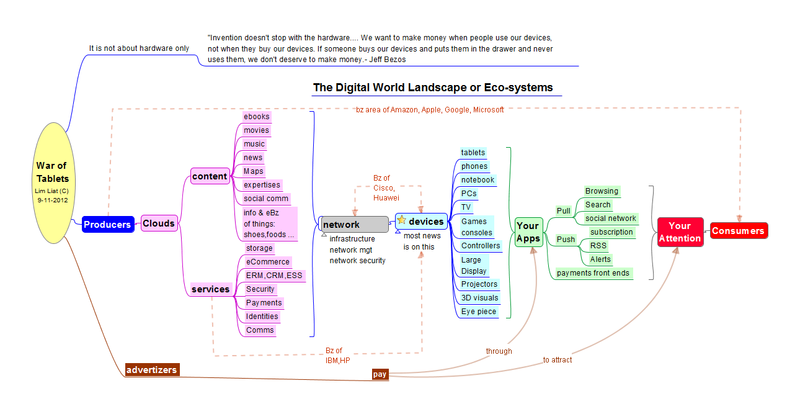 It is about the digital Eco-systems in which the tablet is only a link. It not just the initial purchase but the usage of it to gain access to the vast digital world of content and social connection that matters more. Who will win or loose will depend on how it is used. The digital world Eco-system is presented first. 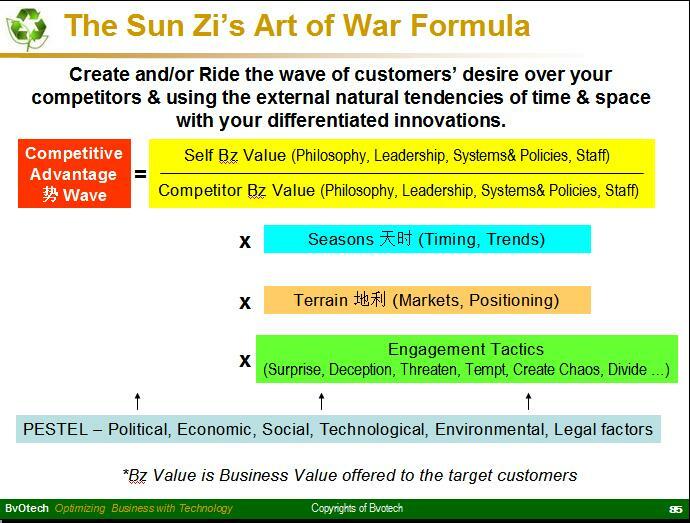 It is follow by my 4D Innovation Ecosystem model to help entrepreneurs to come out with their strategies for survival and growth. Looking at the leaders such as Amazon, Apple, Google and Microsoft, and seeing their views, we get to understand their competitive position and advantages. Should Facebook join the war? “Invention doesn’t stop with the hardware…. We want to make money when people use our devices, not when they buy our devices. If someone buys our devices and puts them in the drawer and never uses them, we don’t deserve to make money.- Jeff Bezos, Amazon. 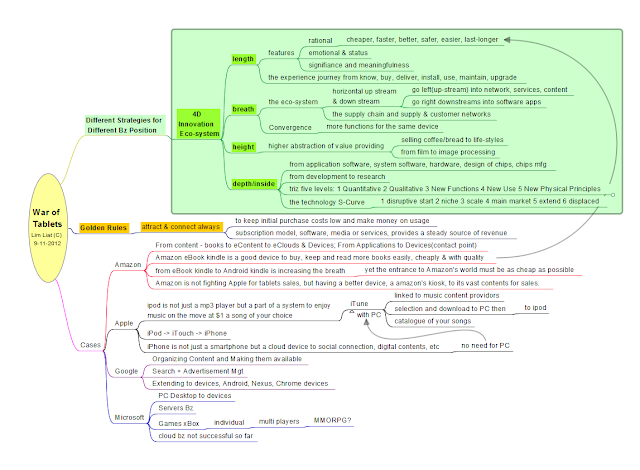 As shown in the mind-map above, Amazon is in the tablet game from its very successful eBook readers. But its specialized eBook readers can be easily replaced by the general purpose tablet like the iPad just as the successful Philips word processor equipments were replaced by PC’s later. But Amazon’s Android tablets are built for eBook reading as first priority. As entrance to its vast amount of content (besides eBooks, Amazon is now like a super mall), it must be cheap and good from the eBook and e Shopping points of view. Amazon will tilt its tablets to create an enchanting experience for e-shopping at its sites and for greater reading and watching pleasure. Apple iPhone comes from iPod (music player), iTouch (no need for PC to buy and play songs). iPhone is but iTouch with phone communication add-on. iPhone is a cloud device and not a phone. Nokia saw the world as phone and expanded from phone but was too slow to reach the cloud of digital content and social connection. iPad is just filling up the gap between the small display of iPhone and the large and not too mobile Mac Notebook. Steve Jobs did not think there was a need for a smaller device in between. Cook thought they should protect themselves from others and come out with iPad mini. But iPad mini is still slightly larger than the other, 7.9″ vs 7″ and it was intentionally for preserving the display of iPad 2 experience (smaller but no loss of display content), showing Apple’s tight adherence to user’s experience. Smaller, lighter, cheaper but no other inconvenience caused. A good guide for all others to follow. Google is still very much information base rather than quality music(Apple) or quality video(Amazon’s intent) base. A great strength is its open standard based vs Apple more proprietary iOS and iTunes store. It is expanding in many directions to establish itself as the main key player in the digital world since its search engine is under challenged from many others, like Microsoft’s Bing and others. Google with its innovative culture will continue to come out with many offerings and may be one of them will make it great like their search engine. For Google then, the tablet needs to be as flexible as possible to do all the wonderful things that they are coming out with. Their mind-set is still very much consumers base and one way of expansion is go into the corporate business with better security and management tools and give Microsoft and IBM some challenges. However, being an open platform, there will be some new entrepreneurs that will fill up this gaps well. Microsoft is trying very hard to extend its dominance on and from the PC desktop. The Apple and Android phones and tablets show that you don’t need the complexity of the PC to get things done. Windows8 is integrating phone types apps on the old windows. I am not sure you need to integrate them for the general users; may be for the developers for ease of development of apps. If any user find the phone or tablet apps are not powerful enough for their use, I don’t think anyone want to go into the Windows to get the things done. He could just look for and buy a better apps that can do the job. It any job cannot be done easily on a 4″ or 10″ screen, then go to the PC or Mac to do the job. The job is not for the tablet or phone. Microsoft is an incremental innovator as many have shared. They may not be the first but they have the track record to outdoing the first. eg IE over Netscape, Excel over Lotus 123, Word over Word-perfect etc. Can it do it again with Windows 8? It is a very long and hard catch-up for Microsoft and its partner like Nokia to do. The Value of Social Connection and Network – Should Facebook join the war? We don’t just go into the Cloud to get information and buy things. One of the killer apps of the internet is eMail. The greatest past time now for most people is chatting and connecting with other people. The leader of this Social Network is Facebook. I did not mention it in an earlier post of this because Facebook is not yet in the Tablet War. Does Facebook need to be into the hardware device as well? The common wisdom of the past tell us that hardware is a cut-throat commodity business and businesses are advised to go into software and services like IBM, Xerox etc. But recent stories show that Samsung, Apple and even Microsoft Windows 8 Surface are having great margin of 50%+. Samsung is have great success with its Android devices. So should Facebook go into the hardware game as well like Microsoft? Apple Steve Jobs is famous for integrating software, hardware and design. Google acquiring of Motorola Mobility may show that they also ascribe to Jobs’ view too. My advise is that it all depends. 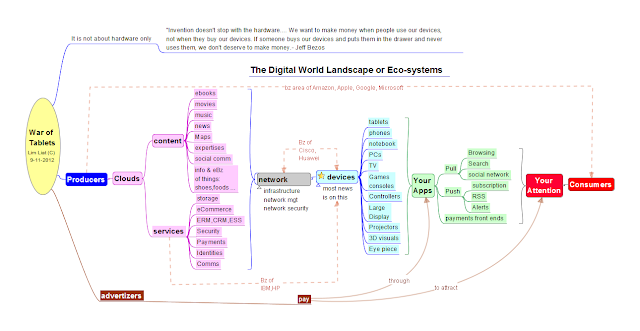 It depends on where you want to play in the big digital Eco-system market place. It depends on your relative strengths with respect to the market you want to play in. Our strengths are not what we think but should be measured externally from the market, against our competitors and from the eyes of our customers. Our strength is not just because we can do it but rather we can do it better than others. It is easy for us but difficult for others. Back to Facebook, for the time being at least, its business is social connection, the bigger the world the better for him. The more the devices that can access it the better. The keys then are for Facebook is to continually offer better social connect experience, new ways of non-intrusive and embedded ads, and define standard interfaces for all others, hardware or software vendors, to connect to them. The greater the size of those who can access Facebook, the greater the size of the potential market, and with its large installed base, the greater is its ability to fend off the competitors like Google+. There is perhaps no need to come into the hardware game unless there some new innovation that need that … but such devices is really against the spirit of social connection. Let others build the roads and bridges, the cars, boats and planes into your wonderful kingdom of best social connection experience. Lim Liat (C) 9 Nov 2012 on a Windows8 machine. Revision 2 10 Nov 2012. Successful entrepreneurs and industrialist (an old term that is seldom used nowadays) thought leaders like to say some extreme things to trigger the thinking and to shock people into actions. Here is one example from Taiwan shared by a friend. The Chinese post is at http://www.businessweekly.com.tw/webarticle2.php?id=16349. 1. The software is important than Hardware. 2. Cloud computing changes and replaces current practices in design and other things. This is the big opportunities and innovative talents are required. 3. Doing subcontracting work make our talented staff like the farming ox – all about the same and not creative. The creative work is done by the outsourcer. 4. University Degrees are not important. Your out-of-the-box thinking is more important. 5. The future is a race. Winner takes all. Must be a race horse rather than plowing ox. 6. Need to pay for such talents highly differentiated remunerations – 10x, 20x, 100x! 7. Adapt to the new world – don’t go back to ask people to watch the old top-tv shows. Ask them to watch the current top TV shows. 1. Hardware and software are both equally important. The key is the integration and best fit. Ask Steve Jobs and Google Brin and Page who recently bought Motorola Mobile for its hardware capability to augment its Androids and Chrome. 2. Cloud and Endpoint Devices are Opportunities. The powerful resources and the brains of the clouds are at the center and need intelligent devices to link up so that its power can be used and enhances by the millions who connect to it. There are businesses for the center cloud and the end-point access devices such as iPhones, iPad. iTunes App and iCloud are the centers. Imaging Dropbox without iPhones/iPad/android!. 3. Subcontracting/OEM work requires talents and innovation as well. They need innovation in their processes and other parts of business models. Subcontractors, unfortunately, does not enjoy the branding of the consumer devices and offering, nevertheless, they need innovations for productivity, effectiveness, and efficiency. Someone said that there is no such thing as hi tech or low-tech businesses only hi-tech or low-tech management. 4. University degrees train our thinking and provide in-depth knowledge that we need for innovations. But may be can be like Steve Jobs, pick your subjects and master them well e.g. Calligraphy. Or an old entrepreneur friend who left Stanford to start his own successful business. Asked him why he did not complete his course. He said he already picked up the knowledge he needed to do his business. Ask Bill Gates and he too would give you the same answer. 5. Speed is only ONE factor of Success. There are More. “The future is a race. Winner takes all. Must be a race horse rather than plowing ox” may be right some times but definitely not all the time. 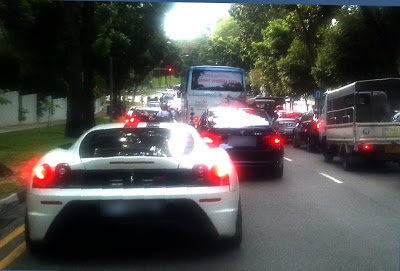 The first mover may have advantages but it all depends on the particular situation. (When the entry barrier is low, then the first mover actually may have the advantage for a short time only. The first mover may be on the bleeding edge and educating the market for the followers!). Microsoft is seldom first but is a good follower and replacer e.g. MS Office replaces Lotus-1-2-3, Wordperfect and IE replace Netscape etc. There are people who think MS can yet do it one more time with Window 8 for the smart-phone business. Read also the new Hare and Turtle Story. See also …http://mind-value.blogspot.com/2011/06/adding-biblical-wisdom-to-bill-steve.html – Success is a combination of multiple factors of speed, timing, strength, creativity, thinking skills, technical skills etc.Google works with the 70-20-10 rule : 70% of budget on core business, 20% related to core business, and 10% on blue-sky not related to current business. So a typical company need may be 7 oxen, 2 horses, 1 dreamer. But that is percentage talking. In reality, everyone in a company should be encouraged to innovate in his own area, extended area and even wider. 6. Need to pay for such talents highly differentiated remunerations – 10x, 20x, 100x ? May not be. It is a team work too beside talents. As the business get complex, the success is the result of great team work of great engaged talented people. Then, it is not about paying a few guys top salaries but about getting fair salaries and share in the extra-ordinary profits from the success of the business. It is about outcome based renumerations where there is no ceiling to your renumerations – it is decided by your customers who willingly pay you for your great offering. Adapt to the new world is a must. Even better is to create the New World. Nevertheless, never ignore the old successes. There are much lessons for us to use. Consider the re-vitalised VM Bugs, Mini-Coopers etc. The old principles, the core strengths, just need a new context. The Critical Thinking – Never be one sided in your thinking. At least be bipolar yin-yang if not more. It always depends on the situations. Everything has value. You just need to find the situation and the people that may need it.